Happy Birthday Honey!!! Today is my sweetie's birthday... 64 !!! OMG... in one more year he qualifies for Medicare. I was laying in bed this morning...remembering when we first met... that was 47 years ago. I was a "senior" Girl Scout and he was an Explorer Boy Scout. The two troops got together to learn how to square dance. The rest was history. He was so cute... awesome hair (bald now) and the nicest person in the world. Oh how I loved him from the first time we met. Isn't it funny how you instantly are drawn to people? God was good to me! So... today we are playing... doing a little shopping... probably have lunch out... getting him some fun things for his birthday.... stuff for our Alaska trip... you know... just bein' together! Tonight we are going to dinner with some of the family. It should be a great day! 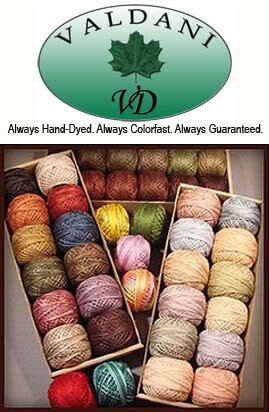 I'm working on more of my wool applique blocks for a NEW wool quilt at Cinnamon's. It's so cool... it's from Geoff's Mom designer. I'll have to take some pictures of the blocks I've finished and post them for you. The quilt is huge...so we picked 16 of our favorites to put into a quilt so it won't be so overwhelming to a new wool applique customer! Look at this quilt I found.. LOVE IT!! I don't know what it is about this quilt....but I just love it. The colors for one thing... I love the mixture of the blue/gray, red and yellow with a splash of green. Then there is the crispy, white background that just makes it look so refreshing! Don't you think? Yes...this quilt could be mine in a heartbeat! 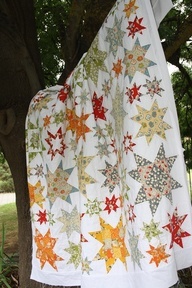 Great design with the inner piecing of the large stars... then mixed with the medium and small ones. LOVE IT!! Look at this !!! I want one of these. I think this is a wonderful idea for graduation... or how about at a birthday party. 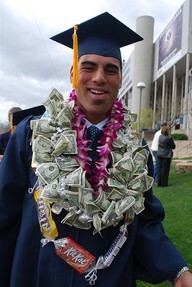 The "birthday person" could wear this lei of MONEY!!! The second best... is that scrumptious candy bar necklace. How cute and inexpensive... and something they will surely use... CHOCOLATE!!! 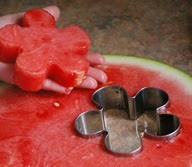 Isn't this a cute way to cut up your watermelon? You could use any style of cookie cutter. Wouldn't stars be adorable???? Hey... you could mix star watermelon cuts, little white marshmallows and blueberries together and you would have a refreshing "American" fruit salad at your next July 4th picnic party!!!!!! Someone should write a book about all the things you can do with cookie cutters... other than just making cookies! Is there one already? Have any of you seen one? Now... I must admit... I'm a lover of pineapple upside down cake. My mom used to make it quite often ... and I couldn't get enough of it. That yummy caramelized brown sugar and pineapple juice and butter! YUM! However, it's not one of my hubby's favorites...so I can't even remember the last time I made one. 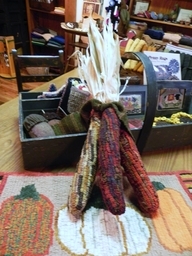 My friend, Faye, made one the other night at sewing... IT WAS DELICIOUS!! THANKS FAYE! 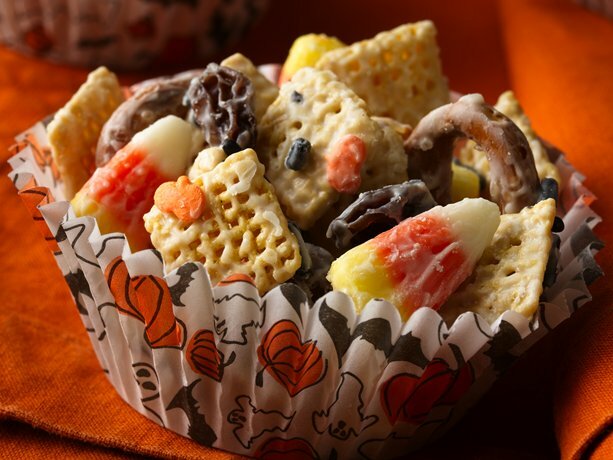 Now this is what I call - GREAT Halloween YUMMY MIX!!! Here's the link for the recipe and supplies! Doesn't it look sssssoooooo good? OMG... I love candy corn!! Ok... I'm off to make a fresh pot of coffee....Jack should be home soon from his "guy" Bible study group that he meets with each Thursday morning.... then he gets to open packages! YIPPEE!! Have a great day!!! Make something FUN today!